Luvon Sheppard â€™70 is a member of the first graduating class of the Master of Science for Teachers program. Sheppard teaches illustration and painting at RIT. 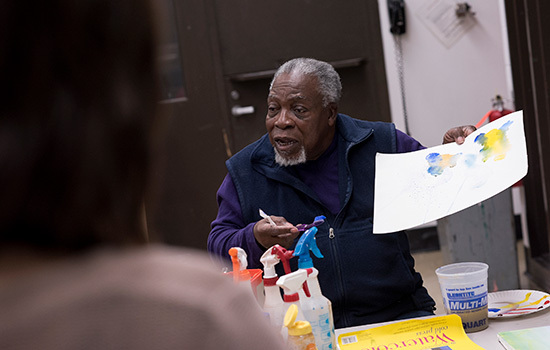 For nearly half a century, the School of Art in RIT’s College of Imaging Arts and Sciences has offered a unique, one-year master’s program for highly motivated students seeking to become certified in teaching art to students in kindergarten through 12th grade. As graduates of the nationally accredited program will attest, the MST program’s rigor and accelerated pace—students must successfully complete 36 credit hours on top of 100 hours of field work, combined with 12 weeks of full-time student teaching in just nine short months—can be daunting compared to competitive programs that typically allow two years. Sheppard, a prior recipient of the Eisenhart Award for Outstanding Teaching—RIT’s highest honor for faculty—credited the program for giving him the focus and the teaching tools to continue succeeding in the classroom five decades later. “Because of that rigor, I believe the MST program gave me an edge that has continued through with me to this very day,” he added. According to Ramich, the program addresses the fundamental purposes and processes of education as well as the impact of social, economic, technological and cultural changes upon education and art. It provides students with an environment that nurtures and promotes a creative approach to teaching the visual arts. Graduate students are provided with a unique and specialized body of coursework that focuses on the knowledge and skills necessary to meet the needs of their future students, both near and far. 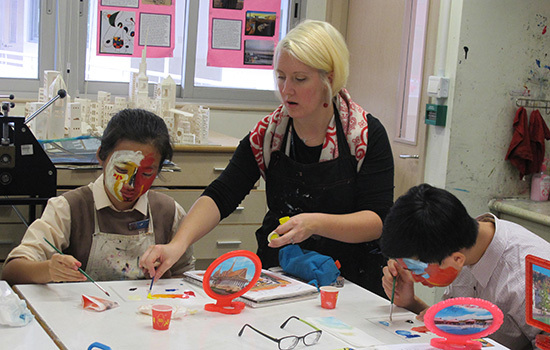 Heather Leck-Leonard Potwin ’11 teaches art to nearly 250 students across several middle- and high-school grades at a private school in Hong Kong called Po Leung Kuk Choi Kai Yau School. “I am so thankful I was able to student-teach across literally all grades (while enrolled in MST) because my classroom management and academic strategies are now more fluid and I feel better able to handle situations as they come up,” said Potwin, whose school is located in a mountainous area of Kowloon—the mainland area of Hong Kong. The RIT program emphasizes innovation and creativity in teaching and learning through research, studio inquiry and community involvement. Partnerships with area school districts, museums, practitioners, community support agencies and the local art community are key elements in the curriculum’s design. To achieve that goal, MST has forged collaborations with important community and educational organizations, including the Rochester City School District, Rochester Prep Charter School and more than a dozen other Rochester-area suburban, rural and regional school districts; Compeer of Rochester; Memorial Art Gallery; and more recently, Young Audiences of Rochester. Ramich also cited the program’s faculty and advisory council as important aspects of the program for contributions that make MST vibrant and stand out. The desire to give back to the community dates back to MST’s earliest days. Neil Waldman ’70, a close friend of Sheppard’s and also a member of the inaugural class, is an award-winning writer and illustrator of more than 50 children’s books. While applying for a scholarship to attend the MST program, Waldman wrote that he dreamed of one day returning to the Bronx, N.Y., neighborhoods where he was born and raised to create a special art academy that would help poor students attend college. “That dream stayed with me all these years,” Waldman recalled. In 2006, he became founder and director of the Fred Dolan Art Academy, a free Saturday school designed to help Bronx youngsters attend an art college. Since the academy’s genesis, 38 students have graduated and nearly all have gone on to college with scholarships, according to Waldman. “The seeds of this academy were sewn writing that piece to win the scholarship for MST,” Waldman said. Kelly Ryan, who spent this past summer teaching art to students at Sidwell Friends School, the Washington, D.C.-based school known for educating the children of presidents and first ladies, couldn’t wait to get started at MST in early August. Role: Supervisor of Art Education, Division of Curriculum, Assessment and Instruction, Buffalo Public Schools. Role: Teaches Intro to 2D Design at RIT and art classes at Small Fry Art Studio in the Rochester Public Market after serving 11 years as an art teacher at School of the Nations in Macau, China. Role: Elementary Visual Arts Integration Teacher, Renaissance Academy Charter School of the Arts in Greece, N.Y.
Role: Art teacher, Queensbury High School, Queensbury, N.Y.
Role: Art teacher and chair of K-12 Visual Arts, Batavia High School, Batavia, N.Y.
Heather Leck-Leonard Potwin â€™11 teaches art to nearly 250 students at a private school in Hong Kong.